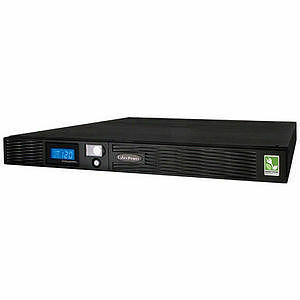 The Smart App Sinewave LCD UPS Series provides an advanced level of power protection to support mission-critical servers, telecom equipment, VOIP and internetworking hardware. The PR1000LCDRM1U has both a Pure Sinewave waveform and Full Automatic Voltage Regulation (AVR) technology, which delivers a consistent and clean AC signal that protects connected equipment and prevents costly business interruptions. The multifunction LCD readout provides ready access to power/battery condition vitals, such as: Runtime, Load, Voltage, and much more. It includes six (6) battery and surge protected NEMA 5-15R output receptacles, including two (2) that are designed to serve as fail-safe options for protecting critical loads. It also comes with four maintenance-free, user-replaceable 6V/9Ah batteries. Bundled PowerPanel Business Edition Management Software monitors UPS status and can provide unattended shutdown of a server. The patented GreenPower UPS advanced circuitry reduces UPS energy costs by up to 75% compared to competitive models. An optional SNMP / HTTP Remote Management adapter (RMCARD201) supports remote management and control of the PR1000LCDRM1U through a standard web browser. The unit also has a unique space-saving design that uses only 1U of rack space. Backed by US-based Technical Support, an industry-leading 3-Year Warranty and a Connected Equipment Guarantee of $400,000. Multifunction LCD readout - The multifunction LCD readout provides ready access to power/battery condition vitals, such as: Runtime, Load, Voltage, and much more.